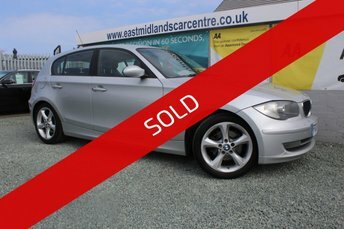 East Midlands Car Centre offers a generous range of second-hand cars in top condition from successful brands like BMW. Well-known for producing cars of sheer opulence and effoertless performance, BMW has released several best-selling models. From the classic 1 Series, to the stylish and capable 3 Series saloon, East Midlands Car Centre has got a BMW to suit almost every lifestyle and budget. Get in touch with our dedicated team of finance experts to get a great deal well-suited to your circumstances. If you're looking to sell your current car, our vehicles experts will give you a free part exchange-quote to make your new BMW car even more affordable!